Out in the backyard garden, the sugar peas are as tall as I am, and we’re picking like crazy. They are the result of a grand experiment of three or four years ago, when the girls indicated that they wanted some investment in the family garden. They chose peas for several reasons: They’re reasonably simple to grow, they sprout early and grow quickly (kids are all about instant gratification, after all), they’re showy, easy to pick and edible right off the vine. Try planting peas this fall, or next spring, as early in the season as you can get a garden fork 10 inches into the ground. Peas love cool weather. You’ll be tempted to eat them right from the vine in your garden. Bring some ranch dressing to the harvest. But don’t eat all the peas outside. Make sure some of them get to the kitchen. Then you’ll be able to use them to make one of my all-time favorite one-pan, quick-fix meals, Gnocchi With Shrimp and Peas. This dish can be made, start to finish, in less than a half-hour if you use frozen or dried gnocchi. Or, if you have some time, try making your own from scratch. Making gnocchi is a bit time consuming, but the result is well worth the effort. All it takes are two baked and peeled russet potatoes, 2 lightly beaten eggs and 3/4 cup of sifted flour. Cube, then rice the potatoes with a fork. Gently fold the potatoes, eggs and flour together on a large cutting board until you have a moist ball of dough. Add a bit more flour if the dough is sticky to the touch, but don’t add so much that it gets dry. Cut the dough into 1/4-cup-size pieces and roll each piece into 1/2- to 3/4-inch diameter snakes (about the thickness of your thumb). Cut the snakes into 3/4-inch slices, place a dinner fork in the middle of each piece and gently push down about halfway to create ridges. Then boil them in small batches (20 to 25 pieces) in salted water until they float, and then about 10 seconds longer. Remove with a strainer to a colander. Toss shrimp with 1 tablespoon olive oil, the rosemary, parsley, red pepper flakes and garlic. Cover and refrigerate at least 3 hours. Bring 8 cups well-salted water to a boil; add gnocchi, stir gently and continuously until all the gnocchi float, about 5 minutes. (If you’ve made your own gnocchi, skip the preceding step.) Remove from the pot and drain, reserving the pasta liquid. 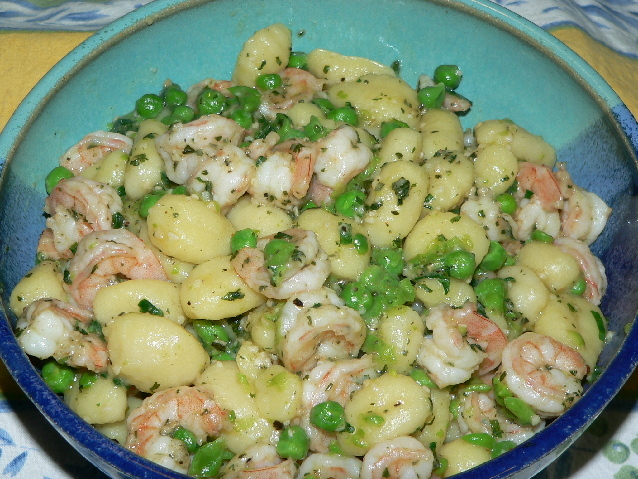 Combine the remaining olive oil with shrimp, peas and green onions in a large sauté pan over high heat. Season to taste with kosher salt and freshly ground pepper. Add the gnocchi and 1/4 cup pasta water to the pan and cook until the shrimp are pink and just cooked through, about 5 minutes.